The NEPAN website offers a good overview of the aims of each of these projects. 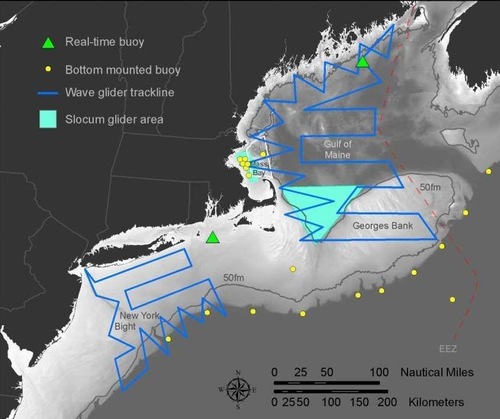 Of particular interest is a real-time buoy deployed near a Coast Guard gunnery range off Rhode Island, which will help the Coast Guard to avoid initiating live-explosive exercises when any of the few remaining critically endangered North Atlantic right whales are in the area. The array of long-term recorders along the edge of the continental shelf will also provide some key new information on seasonal presence of many whale species, as well as helping clarify how far offshore they tend to be during migration (again, especially crucial information for the right whales). A letter from 75 leading bio-acoustics researchers urges President Obama to derail current plans to open much of the US eastern seaboard to oil and gas exploration and development. Last year, the Department of Interior opened the door to new seismic surveys from Delaware to Georgia, which will clarify which areas of the continental shelf are most promising as drilling sites; these could begin as soon as this year or next. 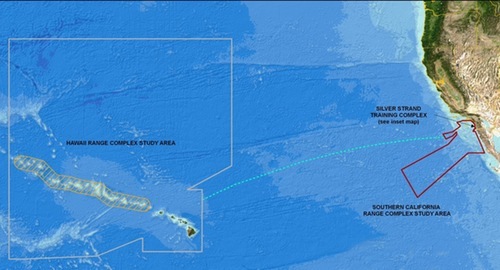 So far, nine applications have been filed for surveys, all 50 miles or more offshore. 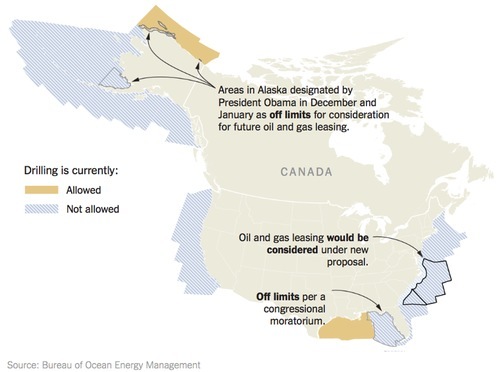 In January of this year, Interior announced plans to issue drilling leases beginning in 2017, with the initial five-year leasing period targeting roughly the same region (UPDATE, 3/15/16: Interior cancels lease planning); in conjunction with opening this area, development was banned in some Alaskan waters (small areas off the north slope and a larger area in SW Alaska). All this has spurred much public outcry, and in March an impressive array of ocean scientists from dozens of universities and research organizations around the world took the unprecedented step of sending a letter to President Obama expressing deep concern about the acoustic impacts of these plans. “The magnitude of the proposed seismic activity is likely to have significant, long-lasting and widespread impacts on the reproduction and survival of fish and marine mammal populations in the region, including the critically endangered North Atlantic right whale, of which only 500 remain,” say these researchers (see the full letter). New dynamic maps from NOAA’s new Cetacean & Sound Mapping project indicate that these right whales use the southeast coast intensively in January and February, and are present along much of the coast in March and April moving north, and November and December heading south. Only during the months of June-October are these whales mostly in northern waters away from the region currently being targeted. Of course, other marine species are present year-round. The Department of Interior suggests that since all activity will be more than 50 miles offshore, it should not interfere with commercial or recreational fishing, or near-shore areas of critical habitat; however, airgun sounds are often audible at much greater distances than that. Energy companies also stress that heavy seismic survey activity in the Gulf of Mexico has co-existed for decades with both commercial and recreational fishing activity. Much of the technology that makes deepwater drilling possible hinges on creating pre-refineries on the sea floor. These include seafloor separators, reinjection pumps, multi-phase pumps and other equipment all operating under extreme pressures and often very high (and noisy) differential pressures. Additionally these deepwater operations are typically performed from dynamically stabilized drill ships and “semi-submersible” platforms that are always churning away. 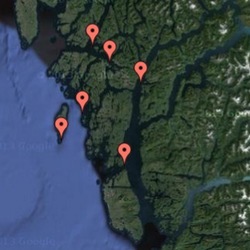 PacificWild, a British Columbian environmental organization, has deployed a network of 6 hydrophones in waters along the northern coast of that province. 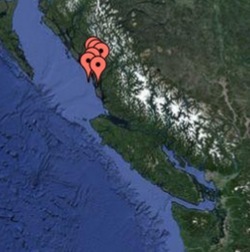 This region of offshore islands and dramatic forested fjords is relatively wild, and quiet, especially as compared to the shipping-intensive region in southern BC around Vancouver Island and nearby Puget Sound in Washington State. But development proposals (including tar sands and other oil and gas ports) may mean up to 3000 supertankers per year will pass through these northern waters, bringing an expansion of the acoustic smog that already blankets most of the world’s oceans. Ian McAllister of Pacific Wild stresses that “Most of the species that are acoustically sensitive rely on a quiet ocean in order to communicate, in order to forage, in order to survive here,” and notes that the hydrophone array will gather crucial baseline acoustic data that can help inform management decisions to be made in the next few years. Live streams of the hydrophones are available, though at most times, there’s not all that much going on; a collection of highlights, as well as streams, is available on this page. To learn more about the project, see PacificWild’s website, or take a look at this brief video (see it here if it doesn’t load for you). The primary target of the legal challenges was the National Marine Fisheries Service (NMFS), which issues the permits (Letters of Authorization) and the Biological Opinion that underly the permit conditions and take numbers. The Navy’s Environmental Impact Statement (EIS) was not directly challenged (a Supreme Court ruling has left the Navy with broad discretion and little room for legal challenges), but the EIS is accepted as sufficient by NMFS, and Judge Olway made a point of chastising NMFS for being too quick to simply adopt much of the Navy’s reasoning about both the impact on animal populations and the practicality (or lack thereof) of keeping training activities out of some areas. The ruling seems to call for a fairly substantial revision of the EIS, the Biological Opinion, and the take numbers authorized by the permits; still, it may be likely that these documents can indeed be revised to fix the shortcomings identified by the Court, without substantially reducing the training activities being planned. Also, an appeal to a higher court is possible, or likely, given the broad implications of the ruling. UPDATE, September 2015: As it turned out, the Navy and NRDC negotiated a settlement, adding a few exclusion zones for the duration of the current five-year authorization. It remains to be seen how the larger issues raised by the ruling may affect the next round of Navy EIS and NMFS authorizations.